Love, real and enduring love, is exceptionally hard to find. It’s a miraculous flowering that happens in this otherwise coldly indifferent world. It’s what we live for, love. It’s what creates many of us, it’s what ultimately defines us and it’s certain it’s all that remains of us. For one reason and another, I’ve spent a lot of time thinking about love. Decades of my time, actually, contemplating it. The fate of love, in particular, has always fascinated me above anything else. Let’s face it -- most of life is like a visit to a dentist’s office. There are the impersonal stares of all the strangers around us, the receptionist’s interest in making sure we pay, and there’s the internal battle to remain positive faced with the faint dread of what could happen. This is how most of us live. Given that it is, it’s no wonder we spend so much time in pursuit of a deeper connection. Not everyone shares my enthusiasm about love, I realize. 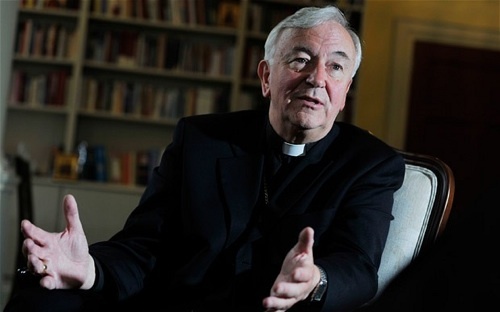 This week I read that the archbishop of Westminster, Vincent Nichols, announced that if employees want to keep their jobs as teachers in Catholic schools in Britain, they should not marry divorcees, or get married in registry offices, or enter into any other kind of legal civil ceremonies (such as civil partnerships) that do not meet with the Catholic Church’s approval. Apart from its bracing fundamentalism, that directive is remarkable for its cruelty. Does the archbishop actually believe there is such a surfeit of love in this world that we can cheerfully prescribe how we encounter it? This stark directive from the archbishop takes aim at both heterosexuals and homosexuals and tells them bluntly that falling for a divorcee or marrying in a borough hall or signing a civil union will not only be disapproved of, it will now get them fired. Well that’s tidy, isn’t it? Just conform to the church’s increasingly rigid interpretation of the gospel and make the life choice to say goodbye to the person you happen to love. It’s what Jesus would ask of you, we feel certain. Who could possibly object to that? I object, but I know there are a lot of people who feel differently. There are many people who put fidelity to an idea, or faith in a theology, over the untidy realities of our daily lives. They prefer biting rules to wiggle room. They reject what the poet Michal Longley calls the drunkenness of things being various in favor of the sobriety of a command. These people fascinate me. In particular their search for clarity, their search for order, at the expense of the complicating insights of their head and heart, at the expense of human experience itself, fascinate me. All my life I have watched the myriad ways in which otherwise principled people end up saying no to life. Saying no, that is, to the very thing that will save them. Because their salvation came at the wrong time, or because the person that offered it was the wrong race, or they had the wrong social or religious background, or the wrong gender, or they once said the wrong thing. Saying no to life, saying no to love, is no small thing. It takes very considerable effort. It is an exceptionally hard bargain that many people make in anticipation of a later reward (perhaps as late as after life). Once you’ve done it, once you’ve said no to life, which is also saying no to love, both life and love tend to say no right back to you. Often till the end of your days. This is inevitable, because, as I said, there is so very little love in the world to begin with. I’ve watched it happen. I have seen people around me possessed by an idea at the expense of own their head and heart. They will exchange what they think and feel for something they have been told and then tell others. Believing they can do no harm, because they stand for good, they can make loveless wastelands of their own lives. And here’s one of the things I have learned from watching them -- the hallmark of freedom is generosity, just as the hallmark of love is kindness. If you can’t find either in the way you’re living or in the way that someone is asking you to live, that’s your first clue you’re going in the wrong direction.